Should You Fertilize Your Lawn When It's Wet or Dry? Good lawn care requires proper mowing, adequate irrigation, weed control and regular fertilization. Leaving the grass clippings on your lawn after mowing reduces the amount of fertilizer needed. Fertilizing on a regular schedule will help grass to withstand environmental stresses and grow thickly, with good color and a strong root system. Determining a good fertilization schedule and whether to fertilize when the lawn is wet or dry will help your lawn to look its best. Proper fertilization can keep your lawn looking green and healthy. Grass needs adequate amounts of nitrogen, phosphorus and potassium. A soil test will indicate the percentages of these components that your grass needs. Your county agricultural extension service can test your soil and advise you on the best type of fertilizer for your lawn. Fall fertilization benefits lawns more than spring applications, helping to increase heat and drought tolerance and produce better root systems. Spring applications help to fortify grass plants for the upcoming growing season. Apply fertilizer to your lawn at eight- to 10-week intervals, and only apply it when the foliage is dry. Homeowners can choose from a wide range of commercial chemical lawn fertilizers. These are labeled with three numbers for the amounts of nitrogen, phosphorus and potassium in the formula, listed as N, P and K percentages. Nitrogen is the most important component in lawn fertilizer, giving grass its green color and aiding in carbohydrate synthesis for energy and growth. The phosphorus in fertilizer aids photosynthesis, plant respiration and energy transfer and storage. The potassium in fertilizer helps plant to metabolize food and controls water absorption. Most organic lawn fertilizers are made from animal manure or plant products. These products can contain varying amounts of nitrogen, phosphorus and potassium, so you must research carefully to determine the right type of fertilizer for your lawn. Cow manure, chicken manure, fish pellets, soybean meal, kelp meal and cottonseed meal are just a few of the compounds used as organic lawn fertilizers. These organic fertilizers release nutrients slowly into the soil and also improve the condition of the soil, including earthworm populations and microbial activity. Too much nitrogen can cause "burning" of grass plants. Avoid burning your lawn by following your lawn fertilization schedule and not applying quick-release nitrogen products. Use a slow-release fertilizer to avoid burning problems. Organic fertilizers release their nutrients more slowly and are less likely to cause burning of plant structures. J. Lang Wood's stories, essays and articles have been seen in journals across the country and online. She is a published short story and essay writer who specializes in travel topics, pets, medical subjects, Florida history, environmental issues, political and business topics. She is the author of the novel "Strays" and holds an Associate of Arts in chemistry from College of DuPage. When Can I Fertilize My Lawn After Planting Grass Seed? How Much Fertilizer Do I Need Per Acre of Grass? 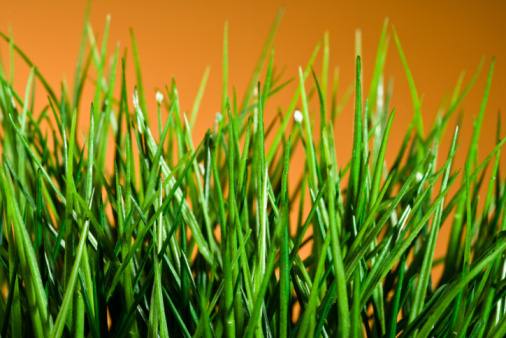 When Can You Mow the Lawn After Fertilizing? When to Apply Scotts Fertilizer to a Lawn?